A person takes 373 pills on average per year. Every time a pill is taken without a doctor's advice, or beyond the prescribed limit, the risk of aggravating the condition increases and can lead to a fatality too. With this in mind, we decided to ease the process of accessing information about a drug. Often, with a plethora of over the counter drugs lying around, it is easy to end up taking the wrong one and we wanted to prevent that. 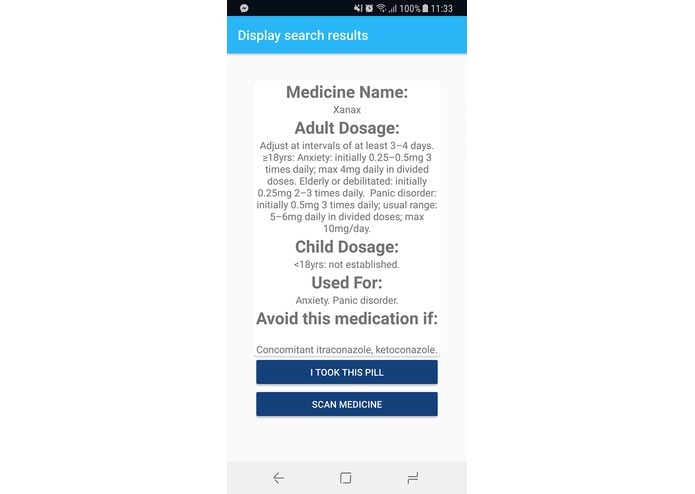 The PillMagnet mobile application uses OCR to capture the name of the drug on the packaging and sends it over to our web service which returns information regarding dosage, usage and contraindications of the pill. The web service has a scraper built in python that uses the name of the drug to scrape the page relating to the drug on the EMPR website. Starting from a desire to use AR, we have built the prototype using Android Studio, Java, Python and different API’s. We used Android Studio to build the mobile app. It uses the Google Vision API to perform OCR. The web service was built using python and hosted using flask. Challenges were all over the place, from setting up the GitHub repository on all 3 laptops, to developing a good UX Experience, debugging the project, finding the right data and learning how to develop for android. The prototype works and displays data for the most common pills taken in the UK. We are happy to see it working and showcasing for a good cause. As a team it was a continuous learning curve. We have understood different aspects of android development, using APIs and front-end development. We are aiming to get some sleep first, after the hackathon. For further developments in the project, we would also like to improve the OCR on the app to make it more accurate when detecting the names of drugs and make it usable for a vast array of medications. We also registered a pillmag.net domain name.